I have just completed my week-long karate workshop, conducted by Masafumi Shiomitsu-sensei. 'Intensive' doesn't quite describe the experience, neither does 'illuminating', but it was certainly at the very least a combination of both. To see a master - and a relatively (forgive me, Sensei!) old one at that - execute movement and technique with such elegance is a wonder and inspiration, and, considering the recent path my own martial arts studies have taken me of late it is a great way to press the metaphorical reset button and gain a good deal of renewed enthusiasm. 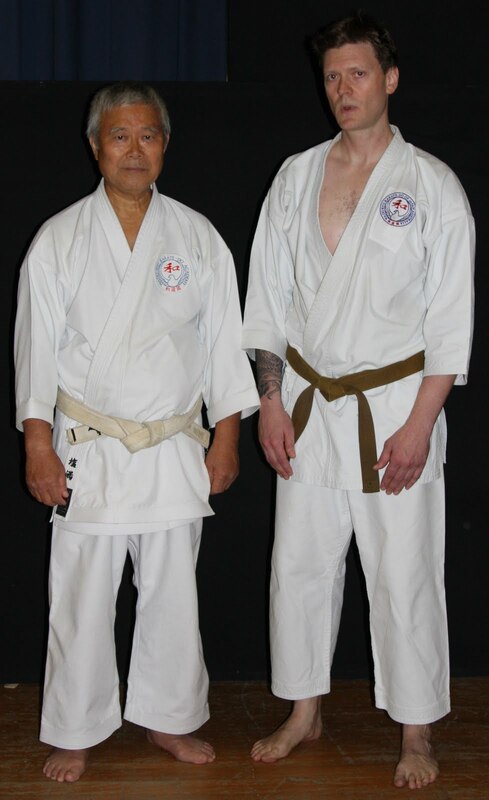 The author with Shiomitsu-sensei, 9th dan hanshi. Diet - I made a conscious decision to be very aware of my diet in the weeks leading up to and during the seminar. I have a terrific diet anyway, but I was mindful of stepping up the fruit and water intake during the day, having lots of carbohydrates, especially late morning to early afternoon, and making sure that I had only small high-protein meals at night when I came home (usually around 22.30ish). I managed to keep the flu bugs away that had been plagueing the family for the last several weeks (I did have about a 12 hour gastro bout on day 1 of the seminar, but recovered quickly and only missed the first session), and now, three days after the workshop (and having just returned home from a massage treatment) I feel great! This year has seen me officially cease studying under one instructor and begin training with another school. This is a pretty big deal within the world of Japanese budo. Generally one doesn't do this kind of thing without there being serious consequences, ie. expulsion from the school. Budo does not allow for the chopping and changing of instructors - when one commences study, in the traditional sense, one stays with their instructor for life. That's just how it is. Or rather, how it used to be. Circumstances forced my hand in my case. I suppose in that traditional context I am a bad student. Without going into the details, I felt that it was no longer possible to continue training under my previous (chief) instructor. My usual instructor understood and had no problem with my decision whatsoever, which I greatly appreciated. The difficulty came in transferring to another school, where (Shiomitsu-sensei aside) the standard of training, instruction and understanding is quite different, there is a distinct lack of etiquette in the dojo, and training is geared more towards a curriculum involving tournament events than the pure study of the art. I understand completely the reasons for this - my new dojo is a larger, more commercial operation with a genuine focus on training for kids, and kids need that constant carrot of the next tournament, the next grading. I, however, have never been interested in such stuff. Having said that, I greatly respect the new club, and at the Shiomitsu seminar I witnessed a genuine interest in, dedication to, and love of the art of Wado. The other thing that I have had to deal with has been a demotion of rank. At my previous club I was a shodan for 8 years, and just prior to my leaving I had been informed that this year would see my grading for nidan, or second level black belt. However, I had never received a certificate of grading for my first black belt, and the grading itself is not recognized by either Wado International Karate Federation (WIKF) or the Japan Karate Federation (JKF). When I trained (all too briefly) in Japan in 2005 I was told that my dan grade was referred to as a 'dojo-dan', as opposed to an authenticated and official grading. I felt a bit miffed by this at the time, although now, of course, I understand exactly where the Japanese comment was coming from. Regardless, no one can take away the training I have done. As there is no official record of my grading at either WIKF or JKF headquarters, and having been looked at by the instructors at my new dojo, they have allowed me to begin my training as a 1st kyu, to undergo grading for shodan in Wado-Ryu Karate-Do next year. So, I am now a brown belt. Again. But no matter, I would be training anyway, and at the end of the day, that's what it's all about. I am confident in my technique, and feel that I am coming to a better understanding of the art. More study. More training. I respect your commitment, its admirable.